the only way to obtain raw milk, besides having your own milk cow, is to buy a share of a dairy herd. 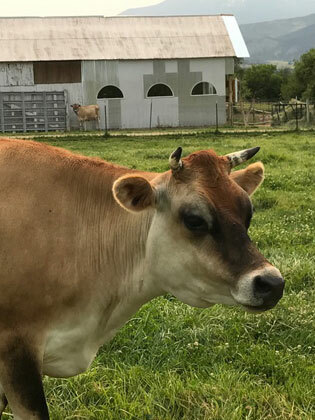 What this means is that you can purchase a portion of the herd which Rancho del Gallo Dairy owns, pay a monthly boarding fee, and you get a certain amount of milk and/or dairy products from that herd. Before joining our Cow Share Program, I take everyone on a tour of the dairy to meet the cows and see our complete operation. I want absolute transparency of all our facilities and protocols. Some people even come learn how to milk and bottle just for fun. Call us anytime to come for a tour! Step 3: Print out the Bill of Sale, Boarding Contract, and Value Added documents, sign them, and return them to the dairy. DO NOT get the Bill of Sale notarized. I have to do that. The contracts will be filed at the dairy where you will have access to them at any time. One family share receives 1 gallon of milk per week during the season that the cows are fresh. We always give the cows at least 2 months rest before their next calves are due, so the milking herd is staggered throughout the year. Practically, what this means is there are times when we don’t have cream, yogurt and butter available, but there should always be milk. Families can buy as many cow shares as they like and I reduce the cost of the additional shares. Specifically, shareholders and I each agree to certain things. Return your jars and lids clean each week. Notify you by email of any and all changes in herd health, availability of milk, location of herd, etc. Provide a copy of all State of Colorado Health Standards and keep a copy on file in the dairy. You are welcome to visit at any time. The cows are milked Monday through Friday around 8:00 in the morning. Please always respect the guidance of Alberto or Edgar for your safety and for the comfort of the cows. Each week please return your empty jars, clean and with the names scrubbed off. Also, please return your lids and rings, again clean. NO rusty or damaged lids, and no writing on them, please. Jars go into the dishwasher racks on the shelves in the store, and lids go into the buckets labelled for them. Please try to pick up your milk on your scheduled day or the next day. If the milk is still in the refrigerator a week later, I will dispose of it. We also make other products for sale at the dairy on a first come/first served basis. These will include yogurt, cheese, butter, and cream weekly depending on the season. Eggs and produce are also available from time to time. All these products are available to buy unless they are labelled with someone’s name. Please leave the money for those additional items in the cash box in the store and your monthly boarding fee checks there as well BEFORE the 1st of every month. If you leave cash, please put it in an envelope and clearly mark your name and what the money is for. I am happy to TRY to make adjustments to your milk delivery days if need be. People often are out of town and suspend their milk for that time, which I am happy to do for now. However, as the dairy grows and we take on more shareholders, this may not always be possible.